This thick, creamy, and delicious Beet and Pumpkin Seed Pesto is an absolute savory delight! Its versatility will have you putting it on anything & everything; and its amazing flavor will have you coming back for more again & again. . . This incredible pesto is certainly one of my favorite creations. The flavor is astounding, the texture is pleasing, and it tastes good on so many things! I've used it as a pizza topping, a dip alongside crackers, a sandwich spread, and served over warm pasta! And, I'm certain you'll discover many more uses of your own. My picky toddler gobbles it up in no time -- which I always see as a good sign! And, just look at that color. . . Whether you are looking for a healthy condiment, a burst of flavor, or a fun & colorful addition to your culinary arsenal, have no doubt -- this beautiful pesto will win you over at first bite. . . 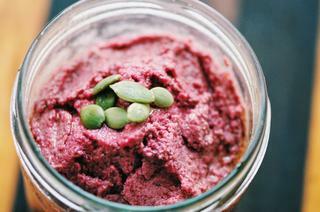 This thick, creamy, and delicious Beet and Pumpkin Seed Pesto is an absolute savory delight! Its versatility will have you putting it on anything & everything; and its amazing flavor will have you coming back for more again & again! In a food processor or blender, combine all of the above ingredients. Blend until a smooth pesto forms.Serve right away, or store in an airtight container in the fridge for up to one week.Enjoy!